Written and performed by the comedy troop Monty Python, Monty Python and the Holy Grail is regarded as troops first proper film featuring a full story. We are now happy to offer you a number of costumes and accessories straight from this hilarious film that humorously parodies King Arthur and his quest. Here in this category you will find everything you need to recreate famous characters and scenes from this well-known and beloved movie, including a variety of Monty Python costumes that will help you recreate such memorably characters as King Arthur, Sir Bedevere, Sir Robin, and the ever-memorable Black Knight (flesh wounds not included). And of course, none of these classic Monte Python characters would be complete without accenting accessories, which you can find here, too. After all, what would the Black Knight be without his helmet. Many of the costumes featured here are complete ensembles, while the accessories and armor found here are made from lightweight polyurethane, ensuring that each and every piece is as detailed and exact as it is comfortable. Of course, you might not find an actual Holy Grail here, but really, it is the journey that counts. And you will be prepared for a hilarious journey indeed when you get your gear from this Monty Python and the Holy Grail section! If you are having trouble identifying who is a witch, Sir Bedevere is happy to offer some helpful tips! 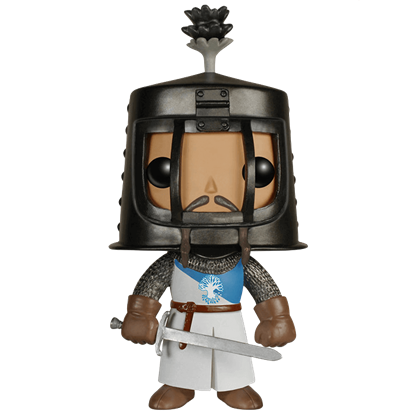 The Monty Python Sir Bedevere POP Figure recreates one of King Arthurs most trusted knights from the hilarious 1975 comedy film. King Arthur and his quest for the Holy Grail is a legendary tale, as well as the basis for the film Monty Python and the Holy Grail which mocks this mythical story. 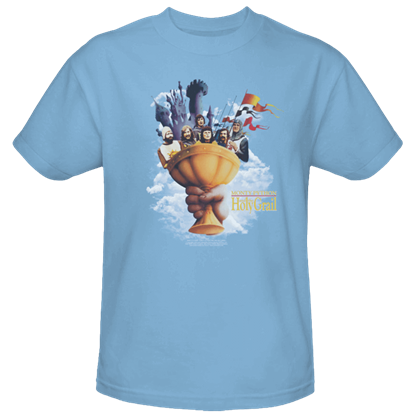 Pay homage to this hilarity with The Holy Grail T-Shirt.